Carrie Hayward’s Fairytale Weddings Guide! Disney Wedding Podcast host Carrie Hayward helps you plan your dream wedding, vow renewal, honeymoon or anniversary at Walt Disney World with this guidebook and bridal organizer! Inside you’ll find details on Memories, Escape and Wishes events, including comprehensive pricing information, money-saving tips, and a budget worksheet that automatically calculates your tax and service charges. There’s also an entire chapter on planning private events like IllumiNations dessert parties—perfect for celebrating a honeymoon or anniversary. And you don’t have to be planning a wedding to have one! If you decide a Disney’s Fairy Tale Wedding is not for you, there’s a chapter on other venues that offer weddings on-property. Plus, we’ve provided information on the basics of getting married at Walt Disney World, including how to get your marriage license, how to have tuxedos and suits delivered to your hotel room, how to have your gown steamed, and how much to tip. Disney’s pricing and policies change constantly, and so does Carrie Hayward’s Fairy Tale Weddings Guide! Once you purchase the eBook version, you can re-download it for free every time the guide is updated. Just tap the CLICK TO DOWNLOAD link in your confirmation email or in the Downloads section of your account. For detailed instructions or to learn how to convert the eBook for Kindle, click here. 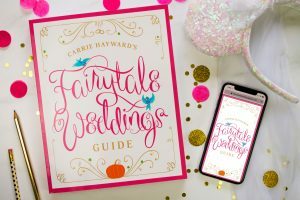 To be the first to know every time Carrie Hayward’s Fairytale Weddings Guide is updated, sign up to be notified via email!